Simulation can help build confidence and improve communication skills. Mentoring provides an extension to the preceptor role by focusing on the human connection and relationship building. Nurse practitioner preceptors have self-identified their lack of mentoring skills and require training in mentoring communication skills. Simulation is a form of experiential learning that has demonstrated success in improving communication skills among healthcare professionals when handling difficult communications. NOVICE nurse practitioners (NPs), even those who are experienced RNs, need guidance and support as they transition into their new roles. The formal preceptor model, in which preceptors provide information, instruction, and feedback over a short period of time, is common for onboarding new NPs. Mentoring, which a preceptor program may or may not include, extends the preceptor role with coaching, teaching, advising, and empowering. Research demonstrates that being mentored during the first year of practice (as a new nurse or new NP), when transitioning to a new role, or when changing clinical focus can help build confidence, which increases productivity, job satisfaction, and career longevity. Other positive outcomes include increased provider and patient satisfaction and the rewarding effects reported by mentors. Mentoring requires effective communication skills, patience, kindness, empathy, honesty, trustworthiness, and an ability to guide and motivate mentees with nonjudgmental feedback. For preceptors to become effective mentors, they must receive formal training that includes time to practice their mentoring skills. Simulation is one way to help new mentors learn effective communication skills and increase their perceived self-efficacy. This article reports the results of a simulation program designed to achieve those goals. In addition to patience and providing support without evaluating and judging, participants noted several skills and techniques as key to mentoring success. Frame of reference: Understanding the novice NP’s thinking as it contributes to his or her behavior can help the preceptor lead the novice down the right path. In essence, the preceptor needs to remove his or her personal frame of reference and find the novice’s. Preparation: Preceptors prepare for crucial conversations by thinking through their own thoughts and perceptions and developing a plan for interacting with the NP. This preparation allows the preceptor to help the NP think through his or her behaviors and the precipitating factors without feeling judged. Communication techniques: Using “pregnant pauses” allows novice NPs to expand on their perceptions, and open-ended questions help preceptors and NPs clarify ideas and “sense” emotions. Culture of safety: Creating a culture of safety for disclosing feelings and ideas can aid in successfully changing behavior. Analyzing the survey results revealed only average levels of comfort among the preceptors in handling difficult communication situations with novice NPs. (See Perceived comfort level.) The strongest areas of comfort were in addressing low performance, lack of professionalism, and lack of teamwork—all common areas that preceptors encounter when orienting novice NPs. The communication simulation focused on handling difficult communications involving defensiveness, incivility, and disrespect. These three specific areas of comfort level were the only ones to demonstrate a trend in improvement in the mean rating before and after the simulation. All other areas demonstrated mean ratings after the simulation that were equal to or lower than before the simulation. The trend in communication improvement, which was measured using the National League for Nursing Student Satisfaction and Self-Confidence Tool, lends support to the premise that using simulation as an instructional method for learning communication skills increases perceived self-efficacy. The preceptors rated the simulation activity as an effective meth od in understanding the recommended articles on mentoring, developing skills, and increasing self-confidence. Transitioning from an expert RN to a novice NP can be stressful. Mentoring can increase NPs’ self-efficacy in this new advanced practice role. However, many NP preceptors lack the skills to enhance this process and require training to increase their self-confidence and communication skills. 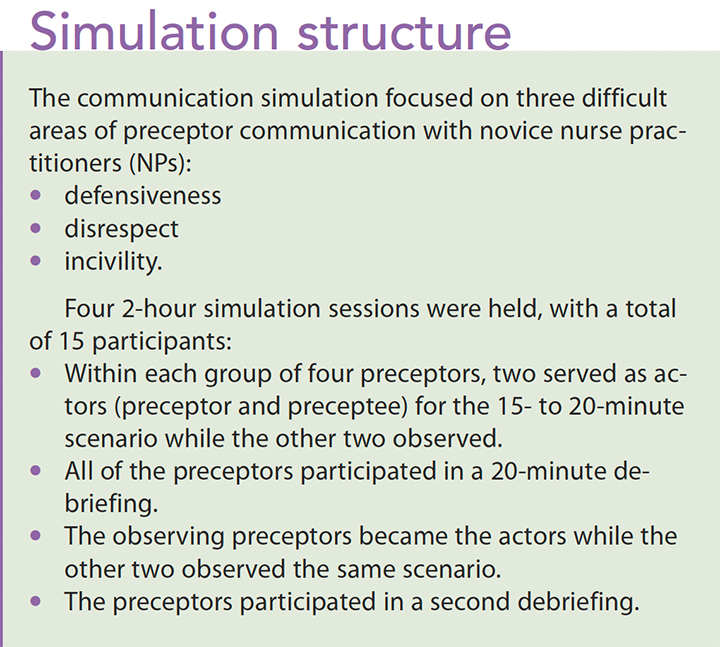 Simulation has demonstrated success in improving self-efficacy in communication skills and preparing NP preceptors as mentors who can ease the novice NP’s transition and subsequently increase retention and satisfaction. Linda Aveni Murray is an assistant professor and director of the RN-to-BSN program at the University of Maryland School of Nursing in Baltimore. Brown MA, Olshansky EF. From limbo to legitimacy: A theoretical model of the transition to the primary care nurse practitioner role. Nurs Res. 1997;46(1):46-51. Eller LS, Lev EL, Feurer A. Key components of an effective mentoring relationship: A qualitative study. Nurse Educ Today. 2014;34(5):815-20. Faraz A. Novice nurse practitioner workforce transition and turnover intention in primary care. J Am Assoc Nurse Pract. 2017;29(1):26-34. Hill LA, Sawatzky JA. Transitioning into the nurse practitioner role through mentorship. J Prof Nurs. 2011;27(3):161-7. Murray LA, Buckley K. Using simulation to improve communication skills in nurse practitioner preceptors. J Nurses Prof Dev. 2017;33(1):33-9. Nørgaard B, Ammentorp J, Ohm Kyvik K, Kofoed PE. Communication skills training increases self-efficacy of health care professionals. J Contin Educ Health Prof. 2012;32(2):90-7. Rudolph JW, Simon R, Rivard P, Dufresne RL, Raemer DB. Debriefing with good judgment: Combining rigorous feedback with genuine inquiry. Anesthesiol Clin. 2007;25(2):361-76. Weese MM, Jakubik LD, Eliades AB, Huth JJ. Mentoring practices benefiting pediatric nurses. J Pediatr Nurs. 2015;30(2):385-94. Zapatka SA, Conelius J, Edwards J, Meyer E, Brienza R. Pioneering a primary care adult nurse practitioner interprofessional fellowship. J Nurse Pract. 2014;10(6):378-86.